The surreal figure is surrounded by a dreamy landscape. In the distance, blue velvet mountains and trees are present. Condensed specks of baby’s breath flowers are also in the far distance. 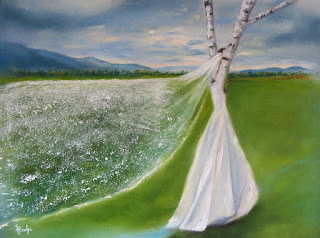 The baby's breath flower field slowly heads up the tree figure which then morphs into a white transparent veil. The figures body is also going through metamorphosis right before your eyes. The transition is at her waist and going up her torso. She is slowly morphing into a birch tree. Although it is clear that her arms are up in the air, the transformation has been completed; she is a tree. Nonetheless, there remains a connection between the figure and the tree. The titanium white strokes on the tree and the white dress connect their forms into one. The paintings composition highlights the tree figure. I placed the figure further towards the right rather than in the center. I usually try to follow the golden ration and the rule of thirds when creating the composition. However, sometimes these principles occur subconsciously. I call this a happy accident! Furthermore, placing the large figure in the front of the landscape rather than in the far distance lets us witness the importance of the figure in the composition. It also creates the feeling of depth. Along with the placement and size of the figure, I purposely painted the landscape clean and flat, so that it does not take away from the figures significance. 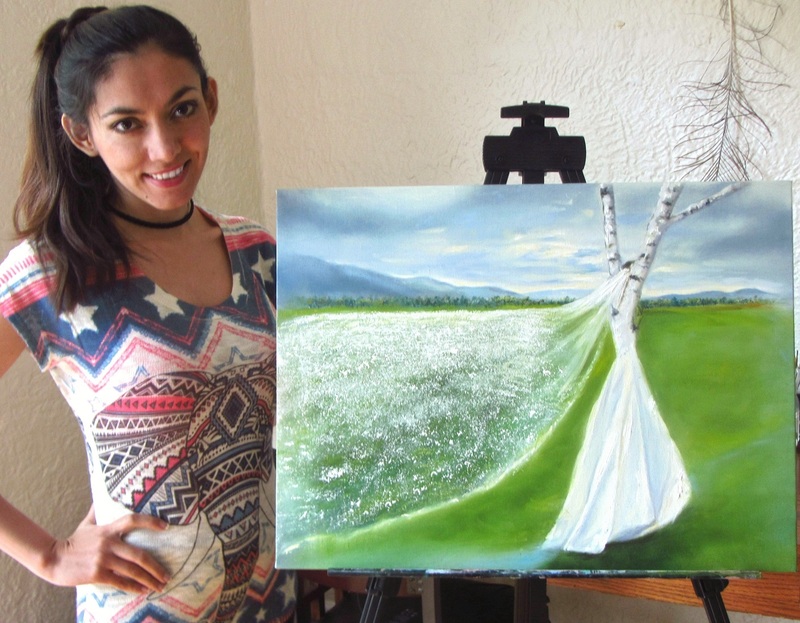 I also used heavy textured paint (impasto technique) to further highlight important areas of the painting, especially the tree, dress, and the baby’s breath field. The figures face and the remaining parts of the tree are left unseen. This enhances an overall feeling of mysteriousness. It leaves you questioning, who is the girl? What is she hiding? It is as if her truth is veiled from those around her. The only part of her that you will notice is her hair. The small raw umber brush strokes are the figures hair. It is the only clue that leads the viewer to believe that she may want to unravel the hidden message. The addition of the hair is a vital part of the painting otherwise it would look like a dressed up tree. A major significance of the painting is the birch tree. The birch tree is the first tree that flowers in the spring. It is also considered to be associated with new beginnings. The birch tree symbolizes a fresh start and can bring courage and determination to those of us who are treading the path of spiritual growth and development for the fist time. Although the birch does appear fragile, it is in fact extremely hardy. This teaches us that in apparent weakness there is often to be found great strength. The birch also promises new life and love, and is a potent symbol of purification and renewal, which focuses on new directions and goals to be experiences in our lives. It teaches the lesson of unselfishness and of caring for the needs of others in ways that help them to flourish of their own accord. Other than the birch tree, baby's breath is also significant. These bright white dots symbolize ever lasting love, pureness, and innocence. I hope you enjoy viewing this painting as much as I enjoyed creating it.